To this day I can’t say what spurred me into action the first time I helped bring a life into this world. 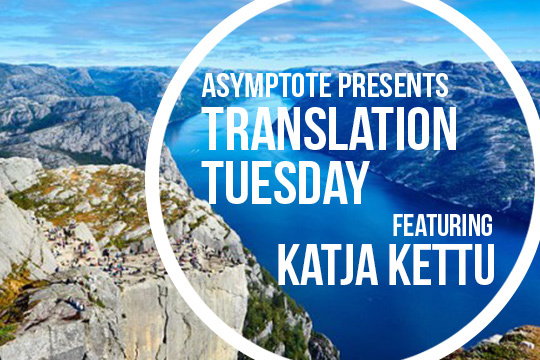 Today we’re thrilled to present an extract of Katja Kettu’s breakthrough novel, The Midwife—also Kettu’s debut in English, available from Amazon Crossing today. This Runeberg Prize–winning work depicts a passionate love story set against the severe backdrop of World War II’s Arctic front and the desolate beauty of a protective fjord. For a taste of this epic romance, and to discover the book that went on to become 2011’s most widely read title in Finland, read on. We could hear Lisbet’s screams from the yard. I’d spent the journey sit­ting on the back of a green Tatra truck, my thighs caressed by the wind. Initially I tried to force my way into the cab beside you, Johannes, but Jouni forbade me. I didn’t protest. There’s no arguing with the greatest rumrunner in Lapland. I didn’t wait for Jouni to haul his stout body down from the pas­senger seat. I barged through a sea of head scarves into Näkkälä’s rose-patterned bedroom. The air smelled of incense and blood. A candle flickered on the altar, and next to an icon, Greta Garbo gave a divine, papery smile. I gripped the white lintel decorated with lace, because the sight of Lisbet shocked me. She was still beautiful, but distress and pain were pushing forth from beneath the beauty. Her milky-white thighs were caked in blood and mucus, her hair stuck across her eyes, now wide with the fear of death. Without ceremony I slid my hand between Lisbet’s thighs. I recalled my very first delivery, at the Alakunnas house­hold, just as I did every time I midwifed.